Wow! What a month! Since posting my free Fir Tree Washcloth pattern last month, I’ve been busy focusing on market prep and holidays and more importantly, spending time with my family. That’s what it is all about, after all! The other day, I posted a picture of my Christmas tree on Instagram and talked about our yearly ornament tradition. We have several traditions, as I’m sure all of you do too, and since I have two little kids, one of our traditions is letters to Santa, and of course, receiving a reply! In the past, I have typically had them write their letters, then used the USPS North Pole Postmark service to send them their reply from Santa. It is such a cool service that really helps bring the magic of Santa to the children when they get a letter back direct from the North Pole in the mailbox. Sadly, this year, I didn’t have my act together, and didn’t make their December 10th deadline. So, on to Plan B, the magically appearing note! As Catholics, we celebrate St. Nicholas Day on December 6th, by leaving a shoe (literal or in our case decorative) out the night before, then St. Nick visits the house and fills the shoes with treats. I remembered doing this as a little girl, and When my oldest was old enough (around 4 years) we started the tradition with him. I thought that this would be the perfect opportunity to have the letters from Santa magically appear. 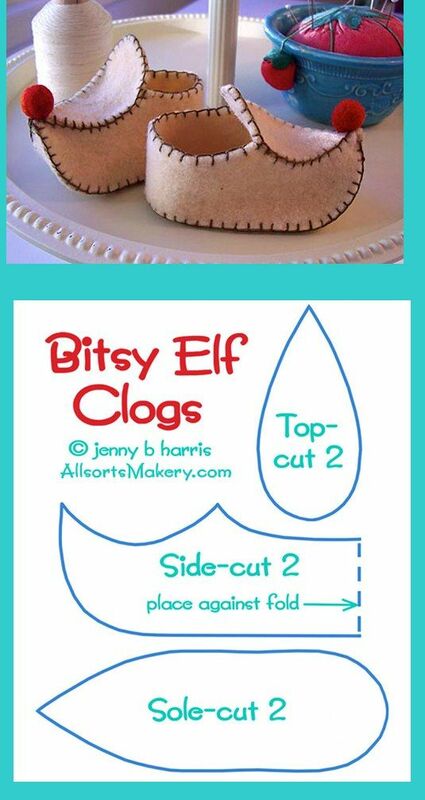 If you want to make your own elf shoes, I used some green felt I had on hand and printed and cut out this pattern. Sadly, it appears that the blog from which it originally came is no longer, but someone has uploaded the image of the pattern. When I think of Santa, I think of him as a jolly old soul, someone who has been around for ages, and because of that, speaks more formally than we do today, think Downton Abbey. So in my head, his letterhead had to reflect that more formal type of address, while still conveying the spirit of the man himself. The clipart I designed for the template is fun, but in an old-school, Currier & Ives, Victorian business kind of way. I wanted a formal business-style letterhead, but with fun graphics to jolly it up a bit. If you want to make your own letter template, these designs and others are available in my Christmas Clipart Bundle on Etsy. If you do Elf on the Shelf, you could even use the elf stamp on your letter, or make your own with the blank seals. The font I used for my letter is from DaFont.com, free for personal use, and called Band Of Reality. I printed mine on some light cardstock because my printer paper is super thin. I tied it with a red ribbon, scroll style, and put the letters in the bed of a cute vintage-style truck I picked up last year, sprinkled some magical, no-melt snow (craft snow), filled up their treat shoes, and ta da! St. Nicholas has delivered! I think it kind of makes up for the fact that I actually did this the evening of Dec 6th (I was a day late! #momlife). I don’t believe in a form letter from Santa, particularly if you have more than one child, because believe me, they will be comparing notes, haha (I like puns, #sorrynotsorry), so I believe it is best to try to be as original as possible when writing your letters. I try to personalize the letters by mentioning achievements, or special events or interests particular to that child, and I always make sure to lay on that Santa bribery good and thick (please kids, don’t make me use my mom voice). That said, please feel free to use my letters this year as examples if you need it. Thank you for your recent letter! My, how fast a year can fly by, almost as fast as my reindeer! You have grown quite tall since I saw you last year. I hope you have been a good boy this year, always trying your best to do what is right, even when it is hard, working hard at school, and being a good son, brother, and friend. I have heard that you enjoy mathematics, and that you are playing basketball again this year. I say! Mrs. Claus and I do occasionally enjoy a good game of Around The World, usually once a year, ho ho! The workshop is bustling, getting ready for my yearly flight! I will see what I can do about your Minecraft Christmas list. Keep up the good work at home and at school. Make sure to listen to your parents, and be nice to your brother. And, Merry Christmas! I received your letter! How clever you are writing your own letter at four years old! I hear you are learning a lot at school and really love your teacher. I can hardly believe how big you are getting! Soon, you’ll be as big as your brother! Are you being a good boy, listening to your mommy and daddy, being kind to others? I hear you love trains! They are fascinating! They go quite fast, but not as fast as when I let Comet have his lead on the sleigh. Now that is fast! The elves and I are hard at work getting things ready for the big night! I will see what I can do about the robot dog and golf set. Keep up the good work at home and at school, and make sure to listen to your mom and dad and try to get along with your brother. And of course, Merry Christmas! Download my Santa Letterhead Template, then choose a festive font, and bring on the magic! You can roll it up and tie a ribbon on it, then leave it somewhere for the kids to find, or leave a note next to the empty cookie plate Christmas Eve, or whatever else you can dream up! Super cute idea; I love the voice you gave Santa!